The average American goes through roughly 70 pounds of clothing each year, creating approximately 21 billion pounds of clothing sent to landfills – five percent of all landfill waste, according to the Council for Textile Recycling. 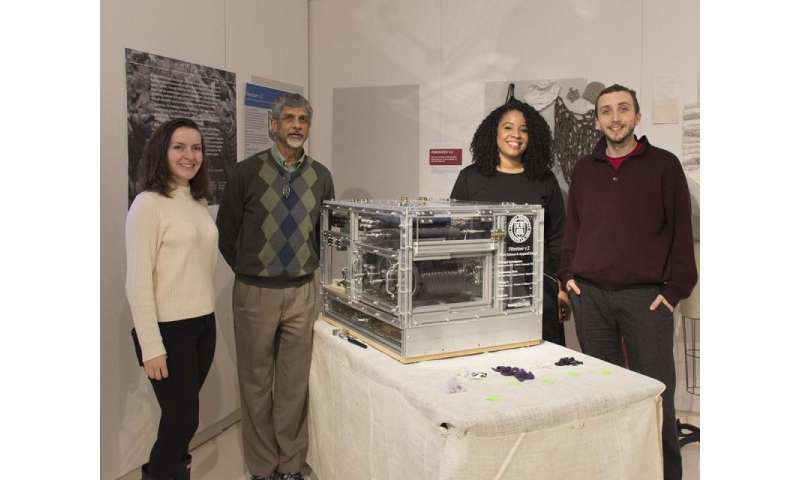 A multidisciplinary Cornell design and research team, assembled to tackle the environmental problem of post-consumer textile waste, has developed a unique fabric-shredding machine in hopes of a zero-waste solution for the textile industry. "The Fiberizer project aims to put textiles, destined for the landfill, to better use as materials to create new textiles and other products, reducing the consumption of natural resources and diverting unwanted clothing away from becoming waste," said Tasha Lewis, assistant professor of fiber science and apparel design in the College of Human Ecology. The Fiberizer takes old garments, which may not be usable or suitable for resale, and turns them into a fibrous mass. The material generated can be turned into something of value the apparel industry can use or reuse, and allows new consumer products to be created. "The industry today already has industrial-grade fabric cutters or shredders that do cut up mixed amounts of clothing that is not sellable or usable," Lewis said. "Many in the industry simply throw it all in and chop it, mixing all kinds of materials together and turning it into what could become carpet padding, insulation in a car, or something similar." Lewis explained that the Fiberizer was designed to allow users to take into consideration what a particular textile is made of, the value of the fiber content and how it is constructed, such as knit or woven material. "This allows for a type of refurbished textile production from reclaimed apparel that can be used for new garments by the industry and create additional revenue streams for apparel, while at the same time reducing waste and promoting sustainability," she said. "Because these items were originally designed as garments, tested, and used as a piece of clothing, we're trying to make that value still relevant for whatever we make out of it." Lewis assembled a collaborative, multidisciplinary design and research team for the Fiberizer project, with students from fiber science & apparel design, design and environmental analysis, physics, mechanical and aerospace engineering, and materials science and engineering. Through design and creation, and development and enhancement of the machine, the team has been working to explore issues, come up with new ideas and identify the potential for a closed-loop supply chain that supports new product manufacturing, enables additional revenue streams from reclaimed apparel, and tackles the environmental problem of post-consumer textile waste. "Through modification and refinements in its design, we can use different cutting blades for different fabrics, because we're finding it's not a one-size-fits-all solution," Lewis said. "We want to know, if the mass material comes out a certain way, what is the perfect application for that particular fiber quality grade of material?" From creating products for the home, garments and art to horticultural applications for growing and nurturing plants indoors, uses for the fibrous materials created by the Fiberizer have proven extensive. "The objective of this research is focused on discovering how best to make end products for home goods and fashion products," Lewis said. "We gather data on each new item created by fiberized material, measuring what can be diverted from the landfill and back onto the rack. "The work of the team has been incredibly strengthened by their different backgrounds and the different way they think in terms of research and study," she said. "They were able to combine expertise, share knowledge, bounce ideas off of each other and trouble shoot problems all from different disciplinary perspectives." The Fiberizer v.2, its official name, was built from the original proof-of-concept project Fiberizer v.1, which was funded by a grant from the Environmental Protection Agency and Cornell's Atkinson Center for a Sustainable Future. To fund the v.2, Lewis secured a Walmart Foundation U.S. Manufacturing Innovation Fund grant. "The grant's call for proposals also requested applicants to name industry partners that we could work with on research," she said. "We reached out to Eileen Fisher's Green Eileen [recycled clothing line], who we have discussed potential projects with in the past." The Irvington, New York-based apparel company is known for embracing simplicity and sustainability. After hearing Lewis' pitch, Green Eileen decided to partner with the project and has donated all of the garments used to date. A goal of the partnership is to give Green Eileen a variety of fiber samples based on the inventory donated, along with end-product recommendations for the types of fibers generated – and perhaps their own version of the Fiberizer in the future, helping the company achieve its objective of having a transparent supply chain by 2020.